A low-income housing project is asking for the community’s assistance as an upcoming deadline threatens to end the venture. The project is being managed by Community Achievement Enterprise (CAE), a subsidiary of Second Baptist Church in Santa Barbara. CAE must raise $156,000 by October or they may be forced to default on their loan and lose their property that is valued in the millions of dollars. According to Pastor Shepherd, the first contractor bought materials with the church’s money that were ultimately used for another project, including gradation and installation of street lines. The contractor also produced fake invoices and submitted them to the loan company to receive payment for work he never completed. The church is now $156,000 short of the roughly $2.3 million needed to complete the project. “[The lending company] won’t let us continue work unless the full loan amount” is in the account, said Shepherd, who added that the church had given the contractor more than one chance to resolve the issue. If the church is unable to secure the $156,000, they may be forced to sell the location before the property is foreclosed on. They would have to find a new location for the church. Goleta is a likely possibility, said Shepherd, due to the lower rent costs. CAE has asked the community to donate what they can and to volunteer where they are able. While not everyone can afford to contribute money, other opportunities to assist include performing general office duties at the church. A GoFundMe account has been set up in support of the project; CAE has held fundraising events at the Southern Baptist Church. Shepherd even called on prominent, wealthy celebrities Oprah Winfrey and Tyler Perry to help pay for the project. Payment in full would have substantial impact on Santa Barbara’s at-risk community, he said. 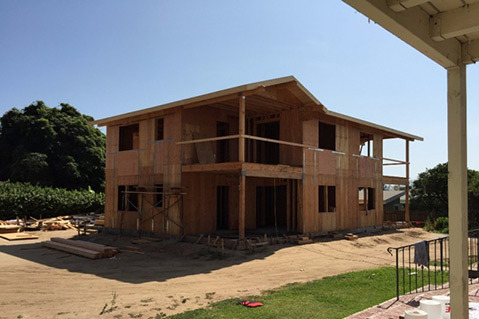 CAE’s goal is simple: to provide sustainable and low-cost housing to those in need while building a community. “We know there is a serious housing crisis here in Santa Barbara,” said Onja Brown, a CAE administrator. “We see a lot of homeless and low-income [people] . . . they don’t have comfortable, affordable housing.” In addition to providing housing, CAE hopes to build a community within their housing project. A partnership has been developed with a local school that would allow young children to interact with senior citizens and would eliminate personnel needed to care for both. The building was named the H.B. Thomas Manor after the founder of the church and is designed to house six low-income seniors who would be selected through a Housing and Urban Development (HUD) Section 8 program. Housing would also be available to qualified veterans and the disabled, according to Brown. Southern Baptist Church has provided welfare to the community long before the housing crisis. Since they were established in 1910, the church has offered a wide range of assistance to the underserved populations of Santa Barbara. They routinely donate food and clothing to growing families and the homeless. “While the city waits for them to come,” Shepherd said, “we go to them.” The church was also one of the first to provide hands-on training during the tech boom in the early 2000s by offering computer training free of charge. “We were on the cutting edge of what are seen as normal activities in Santa Barbara,” Brown said. Brown plans to publish an open letter to the community regarding the obstacles that the project has faced.